On December 20, 2011 Duxbury, Massachusetts based helmet manufacturer Bern Unlimited, Inc. filed patent infringement lawsuits against Burton Snowboards, Vans, and Salomon parent company Amer Sports, according to documents filed with the United States District Court District of Massachusetts. 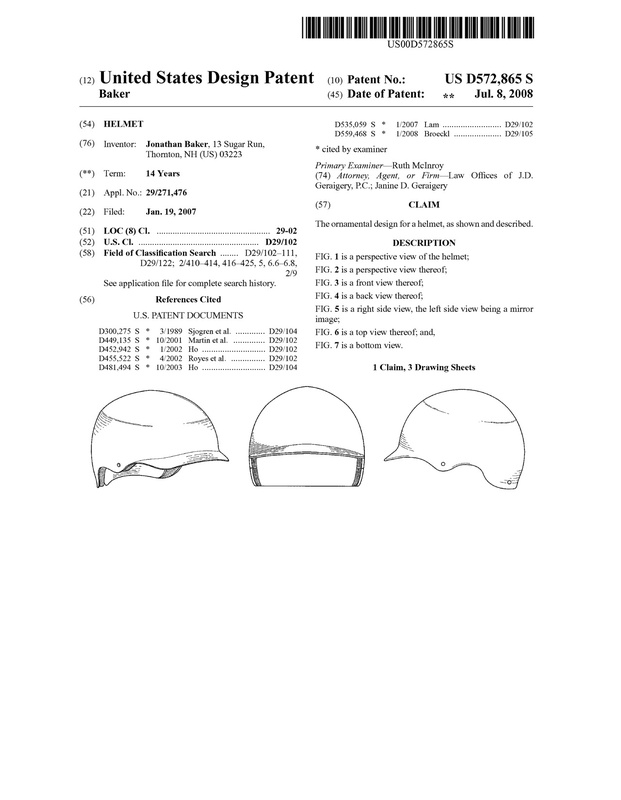 The suits claim that all three companies continue to manufacture products that infringe patent (US D572,865 S) for a helmet with a small brim. The helmets Bern claims are infringing include the Red Mutiny, the Vans Pro-Tec Riot and the Salomon Ghost and Brigade Audio. The patent, awarded to Jonathan Baker of Thornton, New Hampshire on July 8, 2008, shows a helmet that looks much like a batting helmet with no ear covers and a shorter brim. It will be interesting to see if lawsuits based on helmet brim length do in court. For a full view of the patent (and the lawsuit filed against) follow the jump. The suit against Burton is exactly the same as those against Vans, and Amer Sports with the exception of the names of the infringing helmets. funny because Bern stole the design from Capix! Capix was the first brand in the action sports industry to offer a helmet with a brim, but Jonathan & Bern know that. Right guys? he’s right. my buddy rocked capix years before bern made brims. Capix should have made the copyright. That, or whatever baseball helmet company actually made them first. Don’t kayaking helmets have small brims? I swear I’ve seen kayakers use brims for years! Capix is an OEM catchers helmet, for real. Bern is the original visor lid, and they patented it, and the big guys stole it, classic story of the little guy innovating and getting screwed by corporate America. use the brim to scrape the mud out of your vag holes! Folks…. let’s be clear. It’s about ‘who’ patented the idea, and who ‘owns’ the rights to it vs. those who don’t. Who friggin cares who formulated the first batch of something similar to Coke Cola… It’s the folks who had the business acumen and wherewithall to patent the idea who have rights to it. Good luck to Bern Unlimited in thier efforts to protect what they rightfully own.